What is Mediation? - Alternative Strategies, Inc. Mediation is an opportunity for the parties to resolve disputes with the help of a neutral third party. Mediation enables the parties to resolve conflict equitably and cost-effectively. In litigation, one party wins and the other must comply with the ultimate decision of the court. The hallmark of mediation is that both parties’ needs and interests are addressed and understood such that this process allows for a more creative and workable solution. Mediation is an alternative for all types of disputes. Although we have experience in mediating business, health care and family estate disputes, our area of practice focuses primarily on families in transition. Mediation is one way for family members to resolve their own conflicts during and after divorce. At Alternative Strategies, Inc. mediation works because it is a voluntary and self-directed process with the assistance of a third party neutral. The parties take control of their divorce process and settlement rather than simply resigning themselves to the uncertainty of litigation. The parties, not a judge or jury, determine the ultimate structure of their divorce with the help of the mediator. At Alternative Strategies, Inc. mediation works because of the special skills of our mediators. Sympathetic yet impartial, we help guide people to move beyond adversarial positions and towards successful resolution. Our goal is to create a comfortable, confidential environment for parties to identify issues, generate options and evaluate possible solutions. We pride ourselves on developing creative solutions that may work for your family. 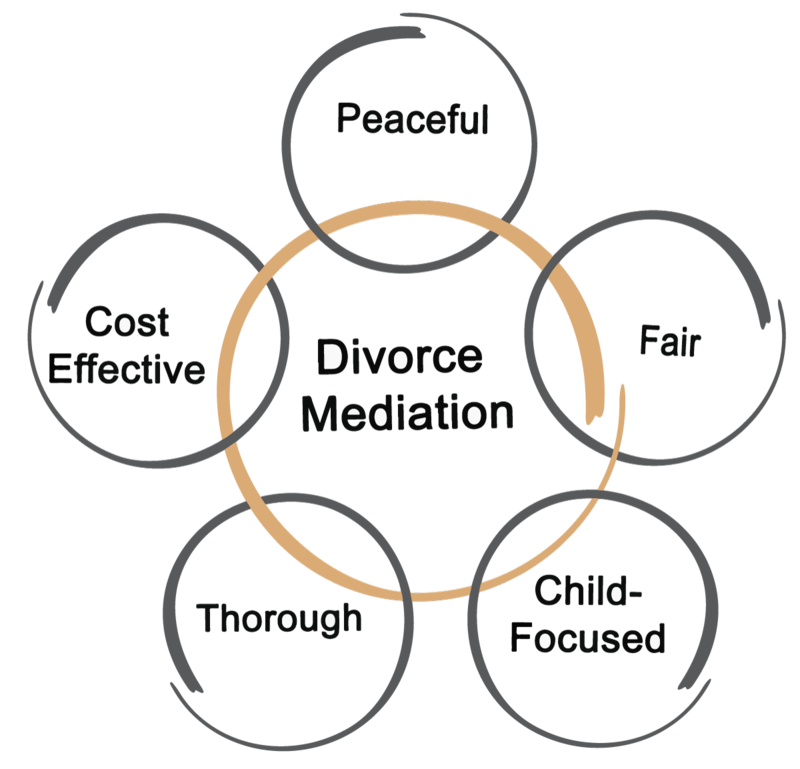 Given this positive framework, most couples that elect divorce mediation do reach a mutually satisfying agreement. Divorce is a time of change for families. Plans for the children, division of property and financial arrangements all need to be determined. Divorce is also a time of great emotional upheaval. These changes and emotions may result in conflicts between family members. How these conflicts are resolved can influence a family’s adjustment to divorce. For most people, conflict is frightening and stressful. On the other hand, conflict can result in the productive airing of differences and typically leads to creative solutions that address the changing needs of all family members. Too often in the divorce process, family members feel like bystanders while lawyers, judges, and others work out these crucial issues that directly impact their family. Even in the face of anger, fear and hurt, it is possible for people to negotiate an agreement which balances the interests and needs of each family member. Research shows that for those individuals who participate and work towards a resolution, mediation does work. Couples who choose mediation are much more satisfied with not only the process but with the mediated agreement. Agreements achieved through the mediation process tend to be more comprehensive than settlements reached through the court system. Most importantly, mediated agreements tend to stand the test of time and are less likely to be renegotiated in the future. In Pre-Decree mediation, the parties work together to resolve all issues encompassed in the divorcing process. In Post-Decree mediation, the parties come together to discuss a specific issue or issues as it relates to their settlement agreement as filed by the court. Marital mediation is an opportunity for couples who wish to stay married and/or in a committed relationship to work on resolving specific issues that affect their relationship. This is not a replacement for therapy, but often complements a therapeutic approach and may result in a post nuptial agreement. Looking for a compassionate, impartial and experienced mediator?